(1997) Once upon a time, we knew the origins of things: what piece of earth the potato on our dinner plate came from, which well our water was dipped from, who cobbled our shoes, and whose cow provided the leather. In many parts of the world, that information is still readily available. But in our society, even as technology makes certain kinds of information more accessible than ever, other connections are irrevocably lost. In Glass, Paper, Beans, Leah Cohen traces three simple commodities on their geographic and semantic journey from her rickety table in the Someday Café to their various points of origin. And through the intimate portrait of everyday workers—Ruth Lamp, a night-shift supervisor at the Anchor Hocking glass factory in Ohio; Brent Boyd, a third-generation lumber-jack from Plumweseep, Canada; and Basilio Salinas, a man who tends the coffee trees at Pluma Hidalgo, Mexico—a whole new world of connections and values are realized as Cohen, Oz-like, draws the reader across time and continents. 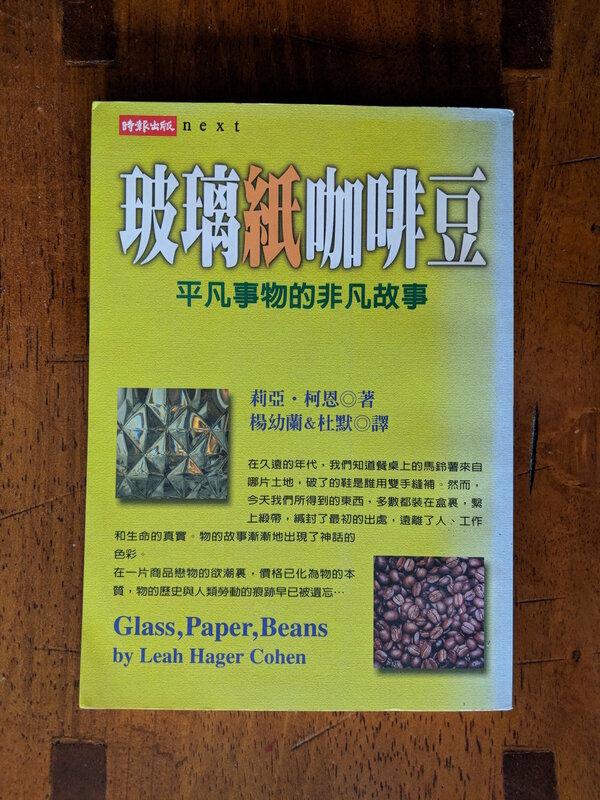 In prose both sophisticated and stunningly simple, Leah Cohen braids the lives of these three unforgettable workers as she traces the origins, myths, and manufacture of glass, paper, and the beloved coffee bean. An elegant and inspired inquiry into the true nature of things, Glass, Paper, Beans is a classic work on the economy of everyday life. A minor miracle...After you read it, nothing—not even a sheet of newsprint—will seem ordinary again. Cohen's tracing of the three objects is fascinating, but what really sets it apart is the poetic beauty of the prose. The book itself seems to vibrate in your hands as you discover an odd mysticism rooted in the most ordinary and most obvious. These are not merely stories about production and commerce, but richly hued, intimate portraits of people whose work and lives are seamlessly integrated...Something to be savored." "At the deepest level, this is a book about storytelling as a mission of discovery and transcendence.